If there is anything that we Indians absolutely adore after the game of cricket and bollywood dance moves, it has to me mangoes. Raw ones, ripe ones, fat ones, slender ones. Our heart makes no differentiation. Most folks will agree when I say that mangoes are the sole reason why summers in India are looked forward to, they are the reason behind smiling faces and content bellies when the sun god increases his brightness settings to 100% and squeezes ever last drop of water from our weary bodies. Perhaps that is exactly why our ever so intelligent forefathers invented this stellar of a coolant, made from raw mangoes. Green mango is a rich source of pectin, which gradually diminishes after the formation of the stone. 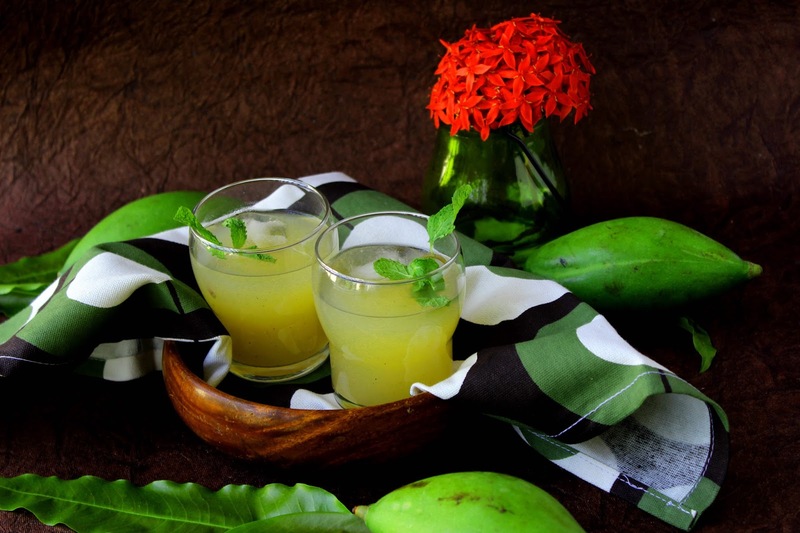 Unripe mango is sour in taste because of the presence of oxalic, citric and malic acids. Aam panna, which is prepared using raw mangoes, sugar and an assortment of spices, quenches thirst and prevents the excessive loss of sodium chloride and iron during summer due to excessive sweating. The drink is mainly consumed in North India and is considered beneficial in the treatment of gastrointestinal disorders. It is also a good source of vitamin B1 and B2, niacin, and vitamin C. In Indian culture, it is regarded as a tonic believed to increase resistance against tuberculosis, anemia, cholera and dysentery. Without further banter allow me to share this age old concoction replete with myriad benefits. - Wash the 2 mangoes thoroughly, add 2 cups of water and pressure cook them. Let them cool down completely. - Peel the skin and remove the pulp from the mangoes. - Pour the pulp in a bowl add mint leaves, black salt, salt & cumin seed powder, add sugar and blend well. - Add some crushed ice and blend again. - Adjust all the other ingredients as per the sourness of the mangoes. - Pass the drink through a sieve before serving.